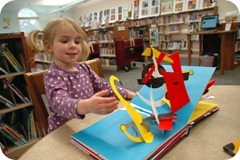 My local library is a treasure trove of awesome pop up books. I consider many of them superb examples of sculpture, and they are certainly accessible to and engaging for little hands. Due to their delicate nature they are not available for checking out, but our library trips are usually a 3 hour long event — much of it is spent engrossed in these books. One of the coolest counting books I’ve ever seen, “600 Black Spots” by David Carter is a celebration of color, shape and math. Now being three, Claire is not quite up to the 600th spot in her counting (she stops around eleven-teen which comes after seventeen and in her mind) but she loves hunting down the black spots in all the pages. This book is seriously gorgeous and it would probably be in my library even if I didn’t have kids. Every single page is different and it’s totally wacky and modern. I’ve got a few more pop up books to share and will do so throughout the week. My original plan was to write an epic post about the coolest pop up books for ABCs and 123s, but we’re racing to get this house on the market and I have lots of painting and spackling to tackle. We’ve even got a few contractors coming in to lend a hand and I totally feel like we’re playing “Designed to Sell” at warp speed! Any staging advice?! 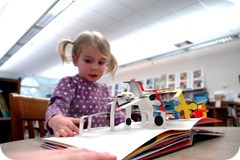 Do you and your children enjoy pop up books? Any favorites to share? I will definitely check that one out. I am not a huge pop up book fan only because my children tend to play with them and soon the pop up is ruined, but this book looks delightful. Every time I find one at goodwill I pick it up. Usually, a few pages don't work anymore, but mostly, they are intact and still fun for Juliet. Oh my goodness! I just adore this book. I've already clicked open the Amazon page and added it to my cart (I'm such an impulse buyer). 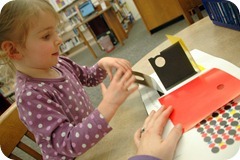 J and I love pop-up books. I bought him the 40th anniversary of 'The Tiger who Came to Tea'. Another impulse buy but it was too gorgeous to let sit on the bookstore shelf. Our library system has the same deal. We have a pop up that is called “The Wide-Mouthed Frog.” It is pretty simple, but funny!! And I have my own tiny, secret collection that the kids can't touch. I've seen this book at the book store—so cool!